Clean and cut crabs into pieces. Cook it in a pan adding chilli powder, 1 tsp coriander powder, 1/4 tsp turmeric powder ,salt and enough water. Heat a pan and add 1 tsp oil. Roast grated coconut, 1 tsp coriander powder, 1/4 tsp turmeric powder, cumin seeds, fennel seeds, shallots, pepper powder, dry red chillies and curry leaves till golden colour and grind it to a smooth paste. Now heat another deep pan, add oil and saute onion and green chillies. Then add ginger , garlic and tomatoes and saute for few minutes. 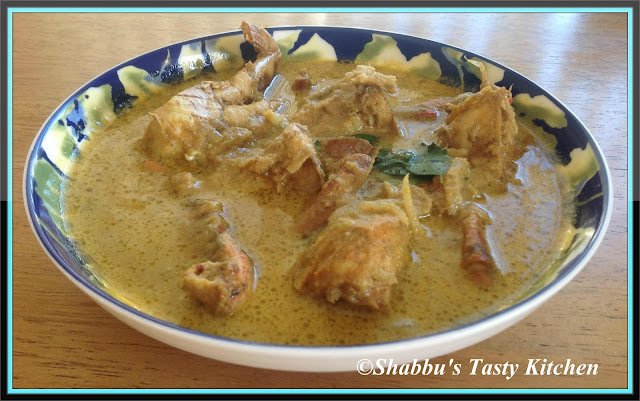 Yummy crab curry.. I have never tried cooking crabs at home..
crab curry sounds interesting...looks yummy too!! Delicious curry with pleasant look.